Here’s a funny thing: I’ve no idea whether or not sweet shops (candy stores) such as the one pictured above ever existed in the U.S. or not. 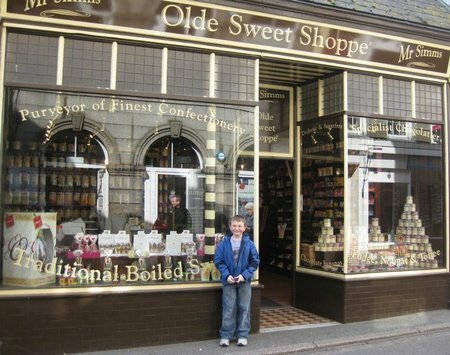 This Mr. Simms Olde Sweet Shoppe is in Falmouth, England. The jars of sweets, especially the boiled sweets, reminded me of the thrill of excitement my sisters and I had just buying candy when we were very little. Choosing which sweets to buy from the shelves of jars such as you can see through the window in this photo was a delightful yet tortuous process – for us and, I’m sure, for my parents. Wander on over to DeliciousBaby for more Photo Friday fun! This entry was posted in Britain, International Escapades, Kid Travel Photos and tagged Britain, Cornwall, Falmouth, Mr Simms Olde Sweet Shoppe, UK on June 25, 2009 by wandermom. I took these photos at Trebah Gardens in Cornwall when we visited earlier this year but I saved them for today – you’ll see why below. This view of the gardens was taken from in front of the house looking down on the gardens towards the bay. According to the history of the gardens, this is where Charles Fox stood as he designed the layout of the gardens. 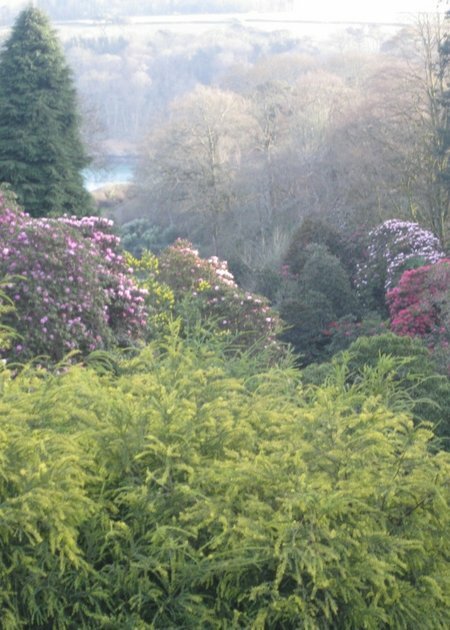 I was in plant-lover heaven during our visit to Trebah, it’s just a riot of natural beauty. 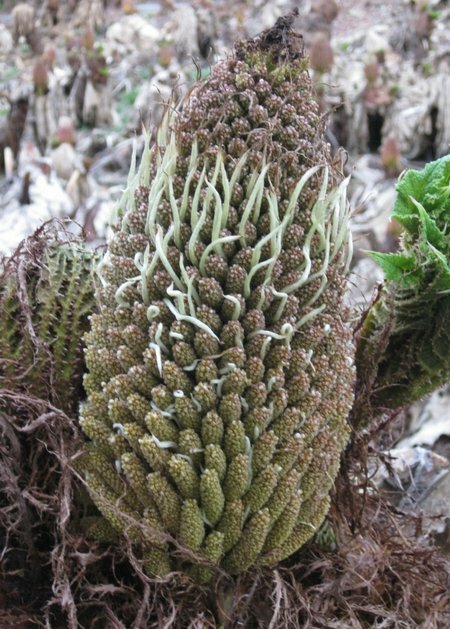 For example, this weird and wonderful-looking specimen is a nascent Gunnera (Chilean Rhubarb) plant. When fully grown, the leaves of the plant are four to eight feet in diameter presenting, as Darwin described, “a very noble appearance”. The Gunnera section in Trebah is fairly large and is, I’m sure, an imposing sight at the peak of the growing season. The kids, of course, didn’t find the gardens themselves as interesting as I did. That’s OK, BigB and his cousin C could have spent all day playing on the rope swing. 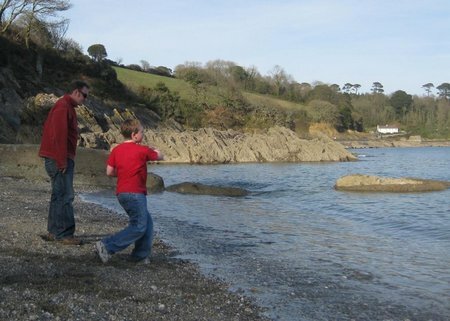 And when we did make our way through the garden down to the beach, BigB got a stone skipping lesson from Uncle D.
Tomorrow is June 6th 2009, 65 years since the D-Day landings. 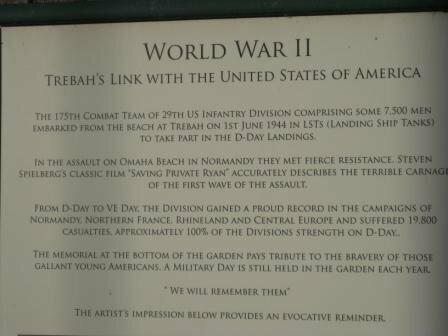 I found it pretty powerful to stand in front of this plaque and imagine the activity on this same beach at that time. A somber moment on a fun-filled day. P.S. If you’re reading this Dad, Happy Birthday!! 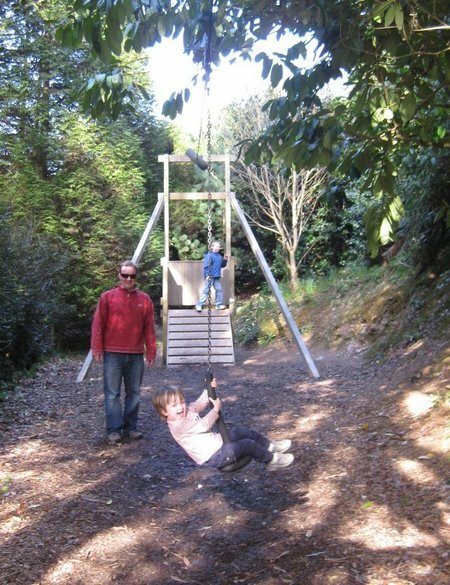 This entry was posted in International Escapades, Kid Travel Photos, United Kingdom and tagged Britain, Cornwall, Trebah Gardens, UK on June 4, 2009 by wandermom. 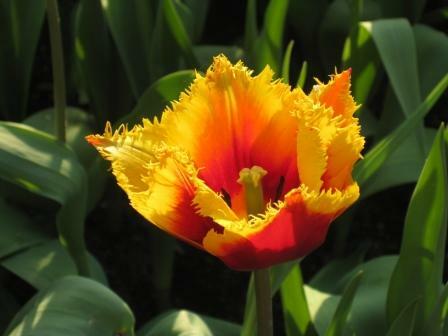 For Photo Friday today, I’m sharing my totally self-indulgent flower photos. Much easier to capture in the right pose than children will ever be These photos were taken at the Mediterranean Biome of the Eden Project in Cornwall, UK in March. 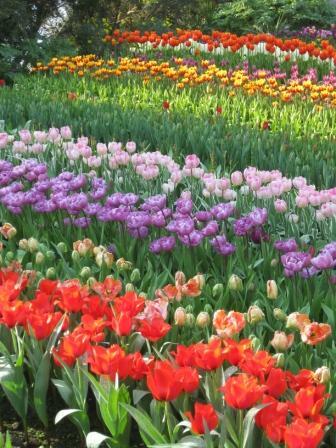 By now, I hope you’ve been able to enjoy tulips blooming in your own garden and it’s been a colorful show. 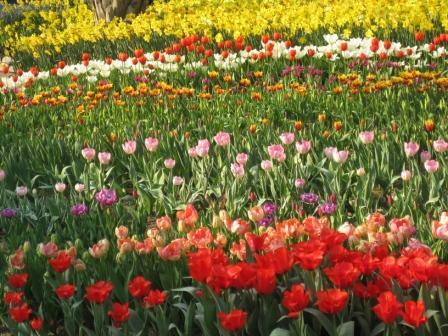 There, don’t you feel so much better imagining the feeling of standing in a field of tulips surrounded by a riot of color and scent? Happy Friday! When I saw Debbie’s photo today, I just had to share the last two books I bought for my boys while traveling – also in Italy. They were a find in a little Italian bookstore which only had about one shelf of English books. Unfortunately these books are not available on Amazon.com, but if you’re in Italy it’s definitely worthwhile to check a bookstore or two for copies. The illustrations are hilarious and though the material is obviously weighty, my kids were just enthralled. 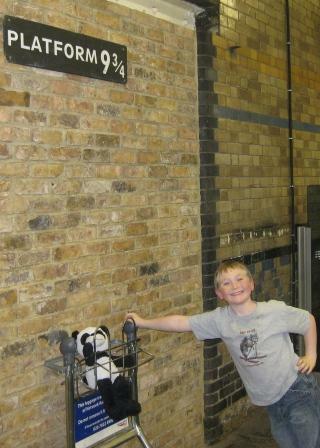 Head on over to DeliciousBaby for more fun Friday travel photos. This entry was posted in Britain, International Escapades, Kid Travel Photos and tagged Britain, Cornwall, Eden Project, England, Mediterranean Biome, UK on April 23, 2009 by wandermom. This is WEEE-Man. 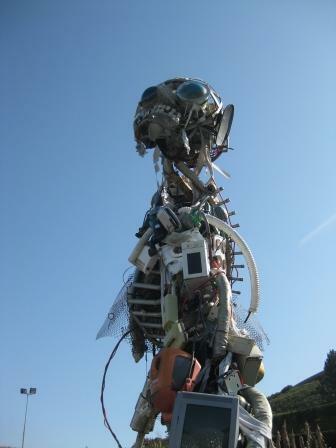 WEEE stands for Waste Electrical and Electronic Equipment, waste which usually ends up in landfill but from which this seven-foot tall piece of artwork was constructed. His teeth are computer mice, his eyes the doors of front-loader washers. 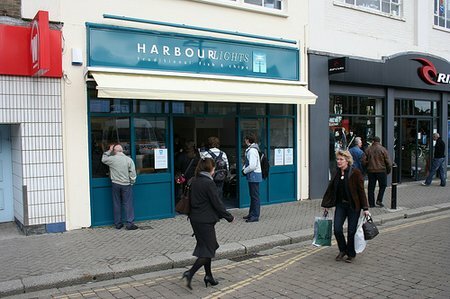 Within the structure there are kitchen appliances such as toasters and microwave ovens; large appliances like washers and tumble dryers; plenty of computer-related equipment and even an electric lawn-mower. 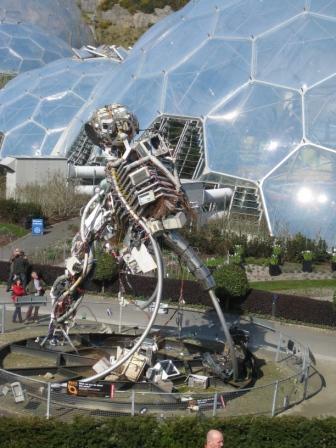 The WEEE-Man currently lives at the Eden Project in Cornwall, UK. When we visited last month, I have to say I was totally fascinated by this installation. The second picture above gives a better idea of the WEEE-Man’s size and, when you’ve taken that in, here’s the thought I’d like to leave you with this Earth Day: the amount of material used to construct this structure is equivalent to the amount that an average individual will throw away during his or her lifetime. Shocking, eh? 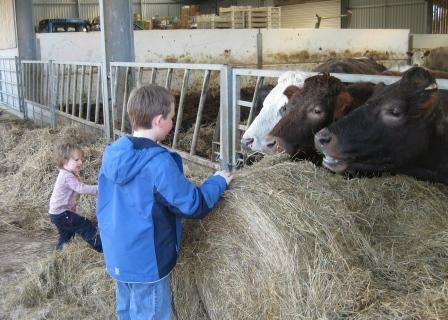 This entry was posted in Britain, International Escapades, Kid Travel Photos and tagged Britain, Cornwall, Eden Project, England, UK, WEEEMan on April 20, 2009 by wandermom. Day 0 (evening): Depart Seattle on overnight flight to Heathrow. 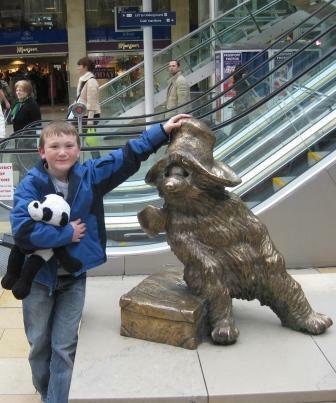 Day 1 (midday): Arrive Heathrow, take the HeathrowConnect train to Paddington, and the train from Paddington to Truro. 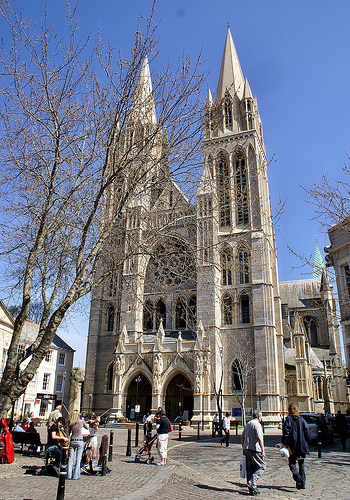 Arrive Truro approximately 20 hours after leaving Seattle. Whew! Day 2: Explore Penryn and possibly Truro – although all sightseeing in the afternoon could be sidelined to watch the Ireland Vs Scotland rugby match Since this will be our first full day in this time zone, I expect that we’ll all be tired from the journey and hence it doesn’t make sense to try to plan a busy day. But, fresh air and exercise walking and exploring these towns, will help with everyone’s jet-lag and hopefully ensure that we all get a good night’s sleep. Day 3: Visit the Eden Project and take a short driving tour of the Lizard Peninsula. 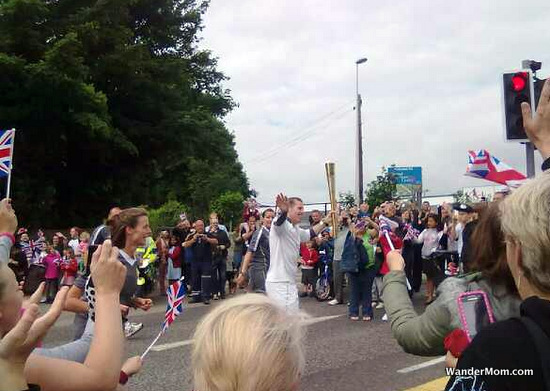 Day 4: A day devoted to King Arthur. Although realistically, I think we’ll only have time for Tintagel, Camelford and Dozmary Pool. BigB really is beside himself at the prospect of ‘seeing’ the Lady of the Lake. Day 5: Hike Bodmin Moor. This is an easy 4-mile hike in beautiful countryside and, hey, it’s a moor, so I can have a Kate Bush moment where I can belt out Heathcliff at the top of my out-of-tune lungs – most likely to the WanderDad’s consternation. (And yes, I do know that Wuthering Heights was set on the Yorkshire Moors, but hey, you’ve got to adapt when you’re traveling). On Day 6 & 7 we’ll be at a family event and we’ll be back in Seattle by bedtime on Day 8. A short, but busy trip. Attractions on my ‘oh-I-wish-we-could-squeeze-that-in-too’ list include: the National Maritime Museum, the Heligan Gardens and any number of other interesting castles, parks and other places. But, cramming our days too full will leave no time to just wander which is our favorite way to travel. If you’ve got a must-see attraction or destination in Cornwall, let me know – and hopefully we’ll be able to add it to our plans. 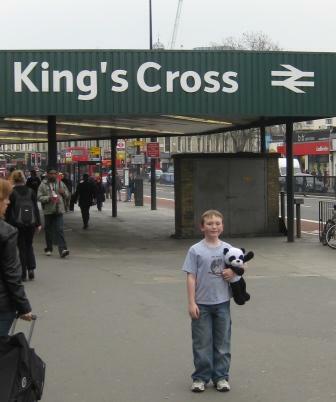 This entry was posted in Britain, International Escapades and tagged Britain, Cornwall, England, Trip Plan, UK on February 18, 2009 by wandermom.